The profession of teaching, and education in general, has often been viewed as one of isolation. Participants relegated to classrooms–devoid of interaction with other adults–except for a few precious moments in the teacher’s lounge, or staged “professional” conversations over large sheets of butcher paper and Crayola markers. If you work in schools, you know that this isn’t necessarily reality, but it probably strikes enough of a chord to make you a bit uncomfortable. The good news is that we are getting better at decreasing isolation in the education profession. There is an evolving understanding that in order for our schools to effectively serve children, the adults who work in them must collaborate, share ideas, give feedback and build our own learning communities. Even more important, those communities must extend beyond our school, district, state and even national “walls.” We must learn from each other. However, as a vocal advocate of Twitter as a tool for educational collaboration, I must make a confession. Lately, I have been guilty of doing a great deal of sharing, with a limited amount of socializing. It is so easy to hit the “retweet” button, share a link I found on Flipboard, or pass along an inspiring blog post. Each of these has merit, but in order for Twitter (or social media in general) to serve its full potential, I need to be a part of the conversation — engaging in discussions, sharing enough for others to get a glimpse of who I really am, and building a network of educational colleagues. Simply tweeting out links won’t break down the isolation barrier. This is easier said than done, because, just like in-person communication, there is a certain degree of fear that goes with interactions via social media. Will I upset someone? Can I effectively convey my idea in 140 characters? Do I know what I am talking about? Taking these risks allows others to get to know us. It builds a level of trust. It results in relationships. It erodes isolation. 1. Take the time to participate in #edchat each week. Be a part of the conversation, share my ideas, and learn from others. 2. Make a point of connecting, face-to-face, with twitter acquaintances while attending ISTE 2012. It’s a modest start, but one that I hope will keep me from forgetting the “social” in social media. Thanks for the reminder! I often share your reflections with my staff and PLN colleagues! 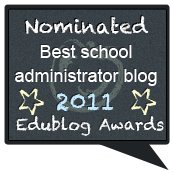 You are very insightful and I enjoy reading about your learning as an administrator! I think my principals learn through your reflections! A supt in NE Iowa! I think that what you state is so true. I feel inspired to use twitter as a tool for educational collaboration for my colleagues. I can dig it, Pal. One of the things that makes me sad about Twitter is that sharing links has replaced the kinds of real, meaningful interactions that used to take place in the comment sections of people’s blogs. There’s this assumption that sharing a link shows that you are interested in a topic — or that you think it’s important. I miss seeing lively and active blog comment conversations because the learning there was powerful and the connections made through commenting were strong. Hope you dig ISTE. More than a bit ticked that I won’t be able to get out there to meet you.